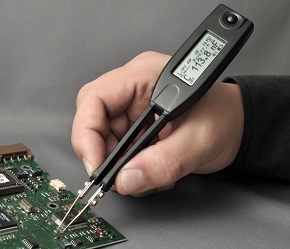 For years, I’ve looked for an affordable LCR meter to measure unknown components–especially surface-mount. I ran into the Smart Tweezers (Model ST3) a couple years ago and wrote up a short review. Since then, Canadian company Advance Devices, has updated the design (Model ST5). This model is very similar, but there are a number of improvements worth mentioning. This entry was posted in Articles, Reviews, Troubleshooting and tagged LCR meter, troubleshooting. Bookmark the permalink.